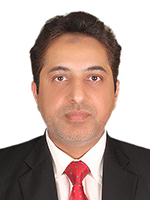 Mr. Mohsin is a fellow Member of the Institute of Chartered Accountants of Pakistan and Fellow Member of Institute of Public Finance Accountants of Pakistan. He has over 15 years of professional experience in the financial sector which comprises of financial planning and budgeting, financial forecasting and analysis, asset investment, ERP implementation, handling tax, corporate and legal matters of the listed and non-listed companies. He also has hands on experience of implementing projects on “Build, Operate, Transfer” and “Public Private Partnership” basis. He has served at senior positions in renowned private sector companies.